Highly regarded and widely recognized, Joseph Hayton began his celebrated career following a lifelong passion for the practical nature of sculpting and stone carving. Combining dedicated skill with an intuitive artistic eye, Joseph’s sculptures exude tangible grace and emotion in a display of unparalleled craftsmanship. Drawing creative inspiration from his father, a joiner, Joseph demonstrated early promise in art and sculpture at school. He went on to study stonemasonry at the prestigious Stone Sculpting College in York, wherein his talent was recognized by the Masonic province of Yorkshire North and East craft lodges. During this time, he was an apprentice stonemason with Yorkshire Stone Craft and would work within the sector for a further six years. 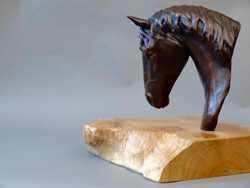 In 2012, Joseph opened his own studio workshop in Pateley Bridge and began his career as a professional artist. 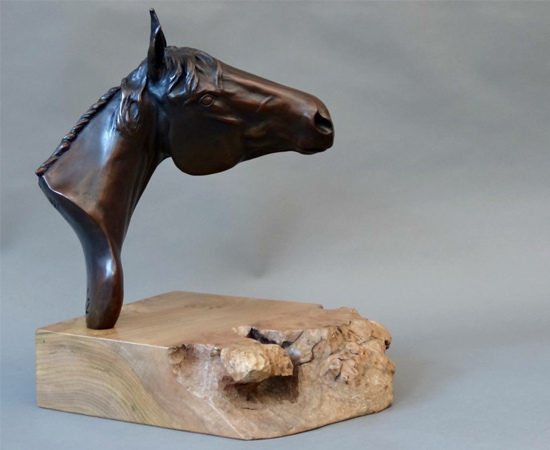 Working predominantly in bronze and marble, Joseph begins his process with studies in clay and covers an assorted range of subjects, including figurative, wildlife and equine sculpture. 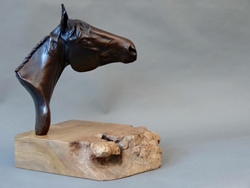 Capturing the detail, delicacy and spirit of his subjects, it is a testament to Joseph’s artistry that in just a few short years he has established himself as one of the UK’s most sought-after sculptors. Joseph has seen great success as an artist, winning a host of awards in a relatively short space of time. In 2014, Joseph completed his monumental, specially commissioned public art work ‘Pillars Past’, representing the history of Nidderdale in three life size stone figures. The striking installation can be seen on the old railway turntable in Pateley Bridge and was ‘Highly Commended’ at the Natural Stone Awards, 2016. Most recently in 2018, he was awarded both the ‘Titanti’ prize for his portrait of James Butler RA at the Society of Portrait Sculptors Face Exhibition, as well as the Arnold Machin Grant for artistic development.